Pradaxa is an anti-coagulant, taken orally. It is prescribed for the prevention of strokes, and was approved to reduce the risk of stroke and blood clots in patients with non-valvular atrial fibrillation. It was designed to replace Warfarin (also known as Coumadin), which has been on the market for decades. The difference between the two is that excessive bleeding from Warfarin can be treated with vitamin K. There is no antidote for excessive bleeding caused by Pradaxa. On November 12, 2011, the manufacturer of Pradaxa reported a link between the drug and at least 260 deaths. Only a month before, the manufacturer had reported only 50 deaths worldwide. The manufacturer, a German company called Boehringer Ingelheim Pharma, said that the deaths were attributed to uncontrollable internal bleeding. The drug is excreted through the kidneys, so impaired kidneys can cause the drug to stay in the body for longer periods of time. Health regulatory agencies, including the FDA, have recommended that before prescribing the drug, physicians assess the kidney function of those patients with severe kidney impairment, as well as those who are older than 75, of low weight, or with replacement heart valves. Kidney function should then be reassessed during treatment. The Therapeutics Initiative of the University of British Columbia reviewed the study behind the approval for Pradaxa. The results of the study were supposedly that Pradaxa would prevent more strokes and save more lives than Warfarin. But the Therapeutics Initiative analyzed the study and found that more people taking Pradaxa experienced heart attacks and had more serious stomach bleeds than those treated with Warfarin. The Food & Drug Administration subsequently asked the study investigators to re-evaluate their data for possible underreporting of adverse events. Additional adverse events that were not reported included strokes, transient ischemic attacks, silent heart attacks, and instances of major bleeding. 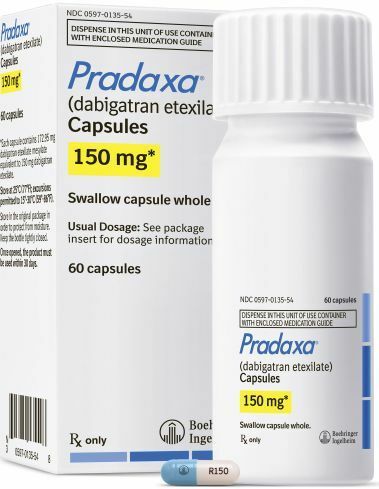 These findings have led to the belief that Pradaxa was rushed to market—ahead of two similar drugs (Eliquis from Pfizer/Bristol-Myers Squibb and Xarelto from Bayer/Johnson & Johnson). On January 10, 2012, researchers from the Cleveland Clinic published the results of a study in which they found that Pradaxa is associated with an increased risk of heart attack. The manufacturer originally said that the drug had only a small increased risk of heart attack compared to Warfarin, but the Cleveland Clinic researchers determined that Pradaxa increased the risk of heart attack and acute coronary syndrome by 33% over other blood thinners or placebo. The manufacturer claims that this is not statistically significant based on the number of actual patients suffering heart attacks. How Can I Find a Pradaxa Injury Attorney? Lopez McHugh is no longer filing personal injury lawsuits on behalf of patients injured by using Pradaxa. If you or someone you love has been injured from using Xarelto or another pharmaceutical product, contact a Lopez McHugh personal injury attorney for a FREE consultation. Call today because if you wait too long, you may be barred from recovering for your injuries by your state’s time limits. Click here to contact us or call us directly at 1-877-737-8525. More Pradaxa Lawsuit news can be found here.